Data analytics is the science of using raw data by extensive use of statistical and quantita- tive analysis for the purpose of drawing business related conclusions and for predicting business outcomes. Data analytics is used in many industries to allow companies and or- ganization to make better business decisions and in the sciences to verify or disprove ex- isting models or theories. At a time when analytics is becoming more universal, India is expected to maintain its edge over major offshore destinations that give analytics services outsourcing. What we have done in this book is compile the interviews of 20 analytics professionals from India. 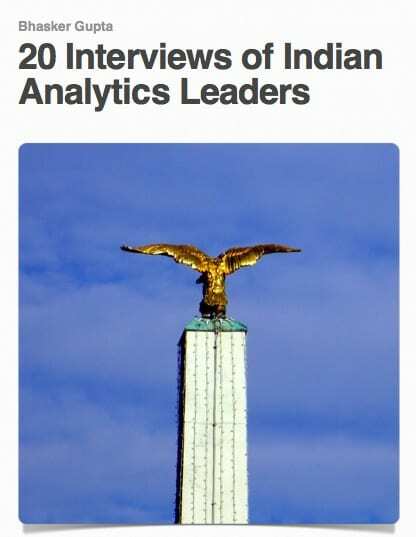 These interviews were done between May and Nov 2012 for Analytics India Magazine. Given the diverse backgrounds of these professionals and depths of experi- ence they possess, this compilation of their thoughts is bound to bring in substantial value for anyone interested in analytics. We need to acknowledge and thank all the leaders interviewed here, for agreeing to be in- terviewed and for their generous hospitality and graciousness throughout the interview process. I read the complete report, its very insightful. Thanks for sharing this report on India’s Analytics Companies.